Niche: Helping people share their story by writing books. 1. How Lindsay transformed her life from chaos to disciplined structure and how that created freedom. 2. Why the mindset training helped Lindsay spend her time delivering results for clients instead of worrying about her perceptions of the world and how it worked. 3. 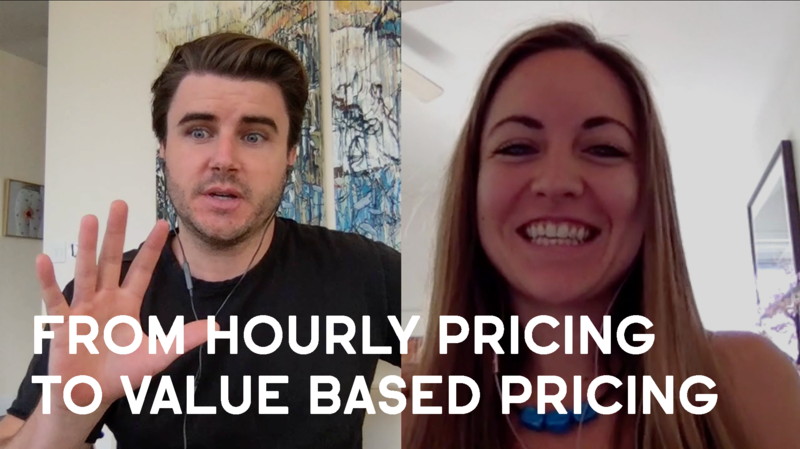 Why Lindsay was burnt out and feeling "cut down" from charging hourly rates and how she fixed it by moving to value based pricing. 4. Why Lindsay was being restricted by her relationships and felt guilty about working on her business and how she cured it by taking a break from them completely. 5. Why the video "Face off with the Devil" shook Lindsay and caused a profound change in her that made her more motivated than ever to pursue her dreams. Stick to the group! Find likeminded individuals in the group and build relationships with them so that you have others to talk to and hold each other accountable. Also, program it into your brain to NEVER give up! The most important thing is to never give up, if you do that, there's no way you can lose! (Really good advice...). Sam Ovens:	Hi everyone. Sam Ovens here, and today, I've got Lindsay Allison on with us. She's a member of the Consulting Accelerator program. Lindsay joined only five weeks ago today. What Lindsay does is she helps people tell their stories through writing their own books, and she's a consultant to help them with that. Through joining the Accelerator program, Lindsay has been able to really work on her mindset, and really, before she had treated business and personal life as two distinct, separate things and that caused some conflict and also some limitations in both areas. Through the program she's been able to really combine the two and that's empowered her in both areas and it's helped her make some huge progress personally and also some business growth as well. Welcome Lindsay. How's it going? Lindsay:	It's so great. Thanks for having me on the call. Sam Ovens:	No problem. So why don't we start out with what was your situation before joining? What was life like and business like then? Lindsay:	It was pretty hectic, pretty sloppy, and pretty messy in the sense that there was just no coherence at all. My day was just a haphazard day filled with whatever I could fit in that day. There was no structure, no coordination. It was just, I'd wake up, okay, well, now I've got to answer some emails. Now I got to do this. There was no structure. So it was pretty much a mess and I knew that I needed some help and guidance. So over the last two years, I guess, I was always looking for some help in the structural and the logical aspects of that. And I guess I put it out there enough that eventually I came across you and it just felt right immediately. So it was just a mess. There was no order, there was no structure and I needed that. And it was just really sloppy. Sam Ovens:	Why did you need it though? Lindsay:	I needed it because I wasn't making any progress. I was stuck at that ... There was a threshold. I had clients. I've been working on this for, I'd say, officially on paper, for five years, maybe a little longer than that. I officially opened up on paper in 2013, but book development and helping people create their books and write their books has been a natural talent within me. And it wasn't until 2013 that someone said to me, "You know, Lindsay, you can charge people for what you do." Because I was just helping people and it was like vultures. People were all over me. They were just wanting my time, wanting to have all of Lindsay basically, and I had no idea how to limit that. Although they were getting these great results, people were getting best sellers, and they still are, they're writing their books, they were getting information from me but then they were either going somewhere else after that, after receiving all this great, free information, or they were just mocking me for all I had because I had no idea how to actually charge people for what I was doing. So it was a huge mess. And the people that I did end up charging for or connected with, I was fortunate enough, or they were kind enough to be a really good person and honest so that they at least paid me. So there was no structure in the payment system, or I was charging time and materials, which was really difficult, starting off copy editing and now realizing that I'm not just a regular copy editor, I actually help people organize their ideas and learning from the smartest people in the whole world. So it benefited me so I could learn the information, but business wise, I was struggling. It was really hard. I was barely making enough to survive, barely making enough to live. So for two years, I had been taking courses, searching, and saying, or putting out into the universe and saying that, "I need to learn the structure of how a business works." I'd never taken business school but I had this natural talent, and how can I align that properly. Sam Ovens:	Cool. Lindsay:	Yeah. Sam Ovens:	So you found Accelerator. What stood out to you about it? Why did you want to join this one? Lindsay:	Okay. So your vibration, your frequency and your voice, I just felt right away, it was the tone or some sort of frequency behind what you were saying, but I knew right away that it was the right thing. That's the best way that I can put it, I just knew. Sam Ovens:	Cool. And then when you joined, what started to happen then? What did that process look like? Lindsay:	Oh, it was pretty cool because I was expecting it to be ... When I had put out the intention of, I want to learn the structure of how to position my day or how to charge, basically the foundations of business, I'd all these pieces that I needed to somehow put together. I was expecting from your course, especially when I first started, for it to be really boring, really logical, and really just straight cut and dry, like, "Here are some charts, here are some spreadsheets, and just put your stuff into it." But instead, it was pretty profound because it just goes to show how far that I've grown as a leader or whatever. Again, that language is not pretty accurate, it's just for the sake of a lack of use of language here. But when you started, it was all about consciousness and how the mind is a virus and all that stuff, and I'd been learning that, or I knew that intuitively and foundationally, in my body, in my being for years, ever since I was really young. So what you did for me was you helped ... It was almost confirmation that I was either attracting that, or that finally someone in the world can explain what's been going on in my head for years, and you had put it into words. And so, it was more about the consciousness and how you explained the happenings of that, that helped me really, really grow, and that's when my mind exploded on week two, which is why it's taking so long for me to finish that. Sam Ovens:	You said it explained what had been in your mind for years. What was in your mind for years? Lindsay:	Well, maybe not so much in my mind but in my being, it's a truth. More so though, when you speak about the mind being a virus and just your fundamental teachings in the course about how the mind works, how the universe works. When you speak about, I'm like, "I've got notes and notes of this stuff." I just got tons of books everywhere imaginable. I've got at least 13 or 14 journals, books that I've compiled and created since as early as, maybe six or seven years old, talking about this stuff and you've just been to put it into words for me that made me feel and experience that I wasn't crazy or that I wasn't insane, and that this stuff is really going on. And you've been able to structure it fantastically in a way that I've never seen it before. It's brilliant, just absolute brilliant. Sam Ovens:	And why was that important for you? Lindsay:	I needed confirmation as to my functioning, that's the best way I can say that. And what I mean by that is synchronicities, so to speak, were happening, and I'm talking about throughout life. This isn't just a recent phenomenon. And just to have you explain that in a way that was logical for me, allowed me to just move forward and to stop spinning my wheels every day, thinking if I was out there or anything like that ... Instead of spinning my wheels, when you explained it, especially in week two, the consciousness and the nature of the mind, it just put ease into my day, and then I was able to finally just focus on the work and just focus on my clients, and focus on the books that I'm developing, instead of worrying about whether the way that I view the world is correct. Sam Ovens:	Got it. And how has that process helped you over the last five weeks? Lindsay:	It's calmed down my overthinking. It's calmed down my overthinking about whether or not the way that I'm navigating my day is correct. So that's one. That's a major one. And it's also helped me stay in what you call the [inaudible 00:10:39] compartments. Because my day prior or my days previously were so messy and so disorganized, and there was no real time frame for any of the things, I'm now able to structure my day into [inaudible 00:10:56] compartments, start going to bed earlier, waking up properly, and I feel energized, and I feel healthier than ever before, I'm eating properly and my brain and my mind and my body just feels better, feels more organized, and I can produce better work for people. I'm submitting things faster than ever before. And especially, from the nature of the topics, there's just a lot of high level stuff, and they're calling me now over the last, I'd say five or six days, so about a week, and saying, "You know, Lindsay, I don't know what you've done in the last two or three weeks, but I've noticed a huge difference in your productivity and in the work that you're producing. So thank you." Sam Ovens:	Awesome. Lindsay:	Yeah. Sam Ovens:	And so what else have you been able to change by going through the training so far? Or are you just still on week two, you haven't moved past there yet? Or have you [inaudible 00:12:02]. Lindsay:	Yeah. Well, I'm just starting actually week three. I'm planning to start it on Wednesday because right now, currently I am working on the alchemy of self workbook, and because I had had all these so called personal development pieces over many, many years that I had just sitting on my desk top or in notebooks piled up, I had the opportunity now because of, especially week two, taking all this information that I had collected or invented over the years and organizing it properly into the systems that you have. So that's just been huge. My whole life feels organized now. Whereas before, I had all these pieces and they just seemed like they were floating, and now you brought it together for me in all of these systems. Also in terms of money wise, I've been able to generate my first consulting client on your system on the second or third week, so about three weeks ago since I started your course. Before I used to charge on a time and materials basis based on the book work that I would be producing. So now instead of charging on a time and materials basis, the client I was able to get after two weeks, it was a four week program that I developed to help him straighten out his ideas, organize all of his manuscript and basically help him organize his whole entire book, stuff that I've done forever but in a four week program, and charging not in a time and materials basis, but on a value based system as you teach. And that has just skyrocketed my ... It's blown my mind. It's just a totally different way of charging. Before I had almost like a job, you're sitting at the desk, you're working for six to eight hours, I'm pumping out words and I'm doing this beautiful high level work, and then I don't feel good about it, well, before, because they're getting all these great results, but I feel like I'm being cut short somehow. And now, it's opened up the possibilities where I can simply do what I've been doing for my whole life and helping people in a four week program on a value based system as opposed to time and materials, so that's just- Sam Ovens:	So how much did you use to charge like per hour? Lindsay:	I used to charge $45 or $55 an hour which is insanely low for what I do, and it was horrible. It was just excruciatingly painful to get up every morning. Sam Ovens:	And why did you choose that model? Lindsay:	I didn't know any other model. Previously, when I first started developing books, it was just a natural talent, something that I did, something that I helped people with, and people would just come to me and ask for help, so I'd done it for free at first. And then it wasn't until five years ago, give or take, that someone said, "You can charge for what you do." And I said, "Oh, really. Okay." So time and materials was the only method that I had available or access to in my reasoning and in my ability at that time. Sam Ovens:	Got it. And then now what are you able to charge with this new value based pricing? Lindsay:	At least $2800 a month for the four week program, but I'm going up from there because they're still getting more than I anticipate. So that's still very cheap, but at least $2800 for now. Sam Ovens:	Cool. And has $2800 per month worked out to be way better than $45 per hour for you? Lindsay:	Absolutely. It gives me stability and peace of mind. Just knowing that in the four weeks I can help these incredible, talented, smart people with all these ideas, get their ideas organized and coherent into at least a rough draft in four weeks as opposed to ... It's just really exciting. My energy level is really high because of that. It's just fiercely amazing. I don't know if I've answered the question but [inaudible 00:17:22]. Sam Ovens:	You did. And so before the interview when we were just chatting, you said that before you'd totally separated personal life from business life. Explain that. Lindsay:	Yeah. Okay. Well, I don't know where I learned it, but somewhere along the way there was a teaching that somehow separated business from personal life. I don't know where I learned it from, who said it, or how it got ingrained in me, but it's totally false. It doesn't make any sense. So prior to the course, for a while, and it was a pretty heavy programming, it was, something would happen in my personal life with family, it doesn't matter what it was, with family, with anything, emotional, it doesn't matter what it was, and then the next day it would affect my performance, especially over the last two years in particular. And so I noticed that over time as being a huge problem because on the third day, give or take, of working, that's when I started to notice that my productivity had really gone down. And I was looking at everything that I was producing and it didn't have anything to do with what I was producing. I couldn't figure it out. So it wasn't until your course that I realized there was something that really clicked in week one or somewhere along there, where you distinguished that there really is no separation between business and work. Everything's connected. And I knew this internally but you made it so obvious. So it really sunk in that way. And that's when I really started to seriously look at some of the deep, heavy programming, have I already been doing that? Have I already been cleaning that up? But this went deeper than other programs and with other mentors I guess. Sam Ovens:	So what used to trip you up the most with this personal life, business life separation? Lindsay:	Relationships, romantic relationships. So that was really something that, in my heart actually, didn't know but didn't actually want to pursue. I wasn't actually ready for one, didn't realize that I wasn't ready for one, still not, but my passion is to develop all this information to help people publish their books, and really infiltrate the information system so that we can grow and become more aware as a collective. And that's really my purpose and my vision in life, and it's so strong that no one can take that away from me. So when I was in that some romantic relationships, you kind of want that every once in a while, but I wasn't serving myself in that environment. So every time I, in my personal life, would go in that direction, it would simply distract me from the work that I was doing. And so now I get to be honest with myself and really ground and say, I'm not ready for that and just really be in my truth about that. Sam Ovens:	So how did the personal relationship distract you from work? Lindsay:	I guess it was either ... Well, I'm so determined and I'm so fierce in so many ways, and super, super determined to get all these things done. And my purpose, and my vision, my calling is just so strong. It's so, so strong that I just didn't have time. And this sounds so cruel and so cold but it's so true. I didn't have time to really spend, really nurturing the other person, or being the best partner that I could be in the future. So it was simply, what would happen was I would be doing my work non, not really nonstop, but just really into it, super focused for at least 8 hours, 9 hours, 10 hours a day, just going at it and the other person is just not being valued, not being acknowledged. And that's just where I was at. Sam Ovens:	But did they mind that, or- Lindsay:	Yeah, very much. Sam Ovens:	So you just weren't finding people who really agreed with it? Lindsay:	Correct. So now I'm aligning more with people who are in that space where we're either fierce together, and they're working on their stuff, and I'm working on my stuff, and everything's cool, and that's good, and there's no complaints. So that's where I'm at now and I've been able to do that and find better relationships with the people who are on the same frequency. Sam Ovens:	Because I think this is a big one for a lot of entrepreneurs. It's like their whole relationships [inaudible 00:23:01]. I've had one before, one of my ex-girlfriends. I met her when I wasn't an entrepreneur, so I had lots of time, right? And then became one and then everything changed, and then I just always felt guilty about working. And it was like walking on eggshells kind of. Is that kind of what you experience too? Lindsay:	Yes. Actually, I have a quote that you might like. Have you read Ayn Rand? Anyways, there's a quote about business, it goes, "He had heard it all his life, pronounced as a verdict of damnation. He had always known that business was regarded as some sort of secret, shameful cult which one did not impose on innocent laymen, but people thought of it as an ugly necessity to be performed but never mentioned." So I think that really sums it up about the guilt of business and what a lot of entrepreneurs feel about the guilt of business, and I definitely felt that as well. It was like, "Why can't you let me work?" It's not even work to me. And that's what I mean by blending the personal and business life even more. Sam Ovens:	So what did those partners say to you when you would work all the time? Lindsay:	It was mostly ... And I wasn't working all the time. It was just I'm so passionate and my vision is super focused, so personal and business are the same. But when I work it's play and it's fun and it's also producing. So to me there was no separation, but somehow in my romantic relationships, there was a separation. And that was hugely affecting everything. It wasn't so much something that was specifically said, but it was an underlying tension and resentment that lingered and I couldn't deal with it anymore. Sam Ovens:	Got it. Lindsay:	Yeah. Sam Ovens:	And I think that's a huge one for a lot of people. And the feeling is this, that you don't have to completely shut off nor have one because there's tons of hungry, hardworking entrepreneurs that have wives and girlfriends and things that are fine with that. You just have to find the right person. Lindsay:	Absolutely. Yeah, absolutely. Yeah, exactly. Thank you. That's what it is in a nutshell. Sam Ovens:	Cool. Well, so going through the program so far, I mean, what do you think has been the one part of the program that has been the most transformational for you? Lindsay:	Okay. So there's been a lot. It was the video, or the video called The Face Off With The Devil. Okay. So when that week came along, or that day came along, for some reason or another it caused a huge explosion for me. And it was really the breaking point or the tipping point, and thankfully I had enough training in the past, mindset wise and everything to be able to really deal with that. But it was really scary for a bit because everything that I had been used to or programmed with was ... The deepest parts of that programming were just revealed and it was so clear that I could not ignore it. So when I basically ... I crashed, I fell hard. I fell really, really, really hard. And when I got back up, because I don't give up, I never give up ever, that was the tipping point or the most helpful for me so far, and that's only the beginning. So I can't wait to see what week three has had in store. Sam Ovens:	So the main thing in that video was that, I see it really ... it's all your fault. Lindsay:	I know this, and I knew this, and I've been working with this over the past two years. So thankfully, I had already been clearing some of those programs with some of the people that I'm working with, but yours just ... It was almost like a military training for me it. But I needed it because no one was ... Honestly, I needed someone in my life who is smarter than me, who could just say, "This is what you're doing. See it and deal with it." So for that, I'm very grateful and I needed it more than I thought. Sam Ovens:	Cool. And you said you crashed a bit. What happened there? Lindsay:	I crashed. It had built up ... So this is the story of it, okay? It doesn't really matter now what happened but it does matter how it helped. The crash itself, I think I experienced insomnia for two days straight and I used whatever coping mechanism that I could to get through it, which worked. And then ... I don't want to get into it that much because there's a lot of synchronicities and weird stuff that happened during that time. But mostly, what happened was when I woke up or came out of it, it was just a deep realization that I'm finally committed. I'm finally, finally, finally committed. This is not just a hobby. This is not just, "Yeah, I do it naturally. Sure. Cool. Yeah, I can produce bestselling books. Awesome. Okay, cool." I'd lost my passion and my zest for it because I was just producing all this stuff, and when I got up on that second day or third day, whatever it was, it was just finally commitment to myself. I'm taking responsibility for my life. Sam Ovens:	Got it. Cool. What's next for you. I mean, what are you trying to achieve this year with your business? Lindsay:	It's so good. It's so, so good. There's so many great things that are happening. So the main thing is that I have actually eliminated a lot from my schedule and from my life, clearing away all the clutter. I have this huge binder of inspirational mindsets training that I have organized for myself in the mornings when I wake up and then when I go to bed to "book end" the day. So that's going to be a huge part of training this year, so to speak. And that's going to be huge. The work gets produced no matter what. The work is kind of a given. The books are going everywhere and the books are doing their thing. It has nothing really to do with that. It's just about charging more for what I'm worth and eliminating all of the clutter that used to be in my life. So over the next year, it's more so "book ending" the day with the training and continuing to produce the work, more bestsellers this year, I'm hoping, that's the plan, and producing two or three more books for sure this year, and focusing on the consulting aspect as I mentioned, the four week program. There were so many people that were falling through the cracks that I ... I can only produce so many books a year, two or three on average and everybody else was falling through the cracks, so how can I help these guys? They're coming to me. How can I produce a really stable and energetic environment for them so they can be in their true selves and produce the work without me having to be there all the time? So that consulting piece, the four week program as well as a couple of major workshops a year In Arizona and here in Toronto to help them develop their book in a group setting as opposed to ... One on one I'll keep more specialized for really super intense books. Sam Ovens:	Got it. Lindsay:	Yeah. Sam Ovens:	Cool. I mean, you've been in the Accelerator for five weeks now and you've seen the other members and all of that. I mean, what would your number one piece of advice be for them? Lindsay:	Oh, that's really great. Well, I would say stick to the group. The group has helped me immensely. I feel like I've finally found like minded individuals. So stick with the group. Don't give up. Make don't giving up a part of your programming if it isn't already. And just be absolutely connected to your vision and your purpose of why you're here on this earth, why you're here in this life. If you don't know that, then work on it first, or work on it at the same time as you're doing your other stuff. Because once you're aligned with that purpose and your vision of what you're doing, everything else is just going to fall right into place. So don't give up and be aligned with your purpose and vision, absolutely, for sure. Know what that is and just be by it. Because a lot of people will come up with some really great ideas, but if it's not aligned with their true core, then it's not going to work. So keep that space, keep that center, keep that core. Sam Ovens:	Got it. Lindsay:	Yeah. Sam Ovens:	Cool. Well, thanks a lot for jumping on and sharing your story. And I'm sure we'll have to get you on again soon because really, you've only gone through two weeks of the program. I mean, there's six weeks, so I'm sure you've got a lot more progress to make and I'm excited to see how far you go. Lindsay:	Thank you so much. Thank you. Thank you for impacting my day and my life, and for all the work that you've done. It's been received and appreciated. Thank you. Sam Ovens:	No problem. That's a lot. Lindsay:	Okay. Bye. Sam Ovens:	Bye.